Good sized sandwich and very tasty. Upgrade to a Canadian at least here. Sauce was good, meat was tender. Overall quite pleased. HUGE dissappointment. I ordered the chicken classic sandwich and it looked NOTHING like what is pictured on the website. In fact, it is nothing more than ground up chicken meat(which in itseld looks pretty questionable)in an oversized hot dog roll with cold shredded cheese. The sandiwch taste was only so-so, i had a few bites and ended up going to our employee cafe for a new lunch. Save yourself the money and pass on this truck. I tried this truck 100% based on the positive user reviews on this site - which is why I felt the need to comment here about my experience. Overall this was a real let down for me. Before I get all bashy bashy - I want to say that the pork itself was very good. Flavorful and tender. Everything else on the sandwich was what I would expect to get at Subway or some other fast food joint. The overall product didn't look anything like it did in the picture on this site. - Bread - this was a hotdog bun. Not any sort of fresh bread (which is what it looked like to me in the picture). Please note, I'm not saying it tasted "like" a hot dog bun. I'm saying it WAS a hot dog bun. - Fried Egg - When people say this, they usually imply over easy with a runny yolk. This was cooked all the way through. I truly don't understand the rave reviews - unless these guys recently cheapened their product. The only redeeming factor was the pork - otherwise it was a complete let down. Best Truck. 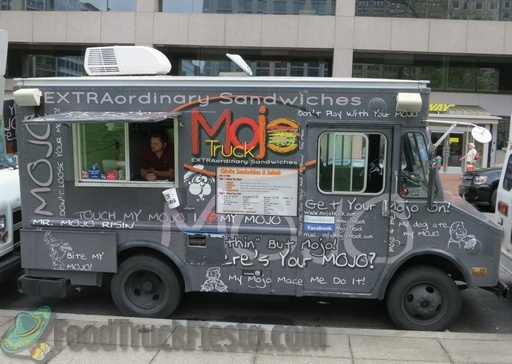 Good bread is the most important part of an amazing sandwich and the Mojo Truck does it right. Probably my favorite food truck in DC. The portion size was exactly what I was expecting. The flavor of these MOJOs are incredible. One of the few trucks I would go back to. OMG, this is my new favorite! Very flavorful sandwhich with just the right kick. All of the ingredients meld together perfectly. The pork is amazing, tender and full of flavor! Best food truck experience so far. 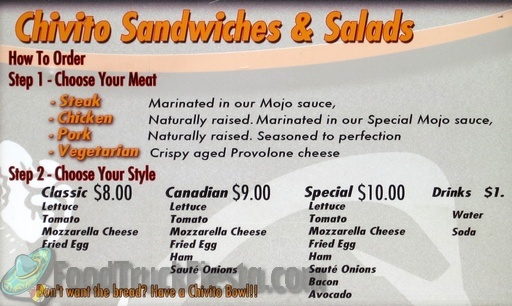 I ordered the Classic Chicken Chivito Bowl. It was FANTASTIC. The chicken was flavorful and fresh. The fried egg on top was amazing with the chicken and the tomato was nice and fresh. I have no idea what sauce/dressing came with it, but it had a slight kick to it, added a lot to the bowl. The Chicken Classic is an excellent sandwich, with lots of warm and delicious chicken and lettuce and tomato on a nicely grilled bun. And the fried egg, can't forget what distinguishes this sandwich from other lunch options! A fine value at $7. Classic, Lettuce ,Tomato, Mozzarella cheese and a Fried egg. Canadian: Same as classic, plus Saute onions and Ham. Special: Same as Canadian, plus Avocado and Bacon. The same can be done in a salad version for those who wanted to skip MojoTruck’s 100% hand-made bread.